There’s nothing like being young during the summer in the city. The living’s easy, even if the life is not. 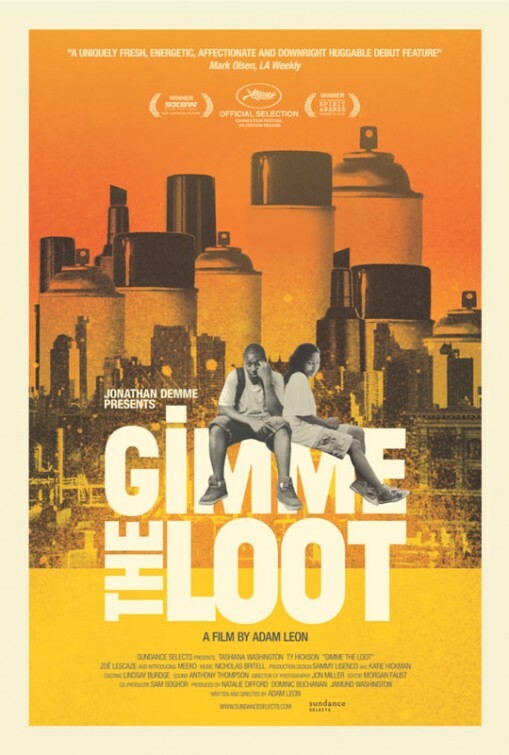 Gimme The Loot, writer/director Adam Leon’s debut feature film, perfectly exemplifies this devil-may-care attitude and succeeds in providing a slice of life that is simultaneously sweet and rough around the edges. Sofia (Tashiana Washington) and Malcolm (Ty Hickson) are two young friends and graffiti artists, living out the summer on the streets of the Bronx and tagging up every roof, wall, and bypass they come across. When the two return to a previous tag to find that their art has been desecrated by a rival gang, evidently Mets fans from their consistent use of the logo and colors, Sofia and Malcolm decide to get back at their opponents the only way they know how: graffiti bombing the Apple at Shea Stadium. Malcolm knows someone who can get them in the stadium after-hours for $500. The exorbitant fee serves as the MacGuffin for the urban adventure that ensues, drenched in the palettes of New York and Summer and Youth. Amateur players Washington and Hickson make for great alternate versions of themselves in Sofia and Malcolm, and despite occasionally showing their immaturity as actors, they are the true foundations for this film’s emotional payoff. Sofia and Malcolm have a phenomenal chemistry and react with a vigor and enthusiasm that makes the audience root for them, even as they attempt to pull off petty crime hijinx. The rest of the cast is authentic and delivers their dialogue truthfully, the cinematography is simple and observational, and the funky soundtrack caps off the upbeat, fun-loving nature of Gimme The Loot. Parts of this movie oddly reminded me of other great coming-of-age films like The Sandlot and My Girl, with a profane, New York City twist. And though it isn’t nearly as memorable as those movies, Gimme The Loot is certainly a promising start from a first time writer/director. Gimme the Loot is now playing at the Ritz at the Bourse.